Synergy+ lets you easily share a single mouse and keyboard between multiple computers with different operating systems, without special hardware. 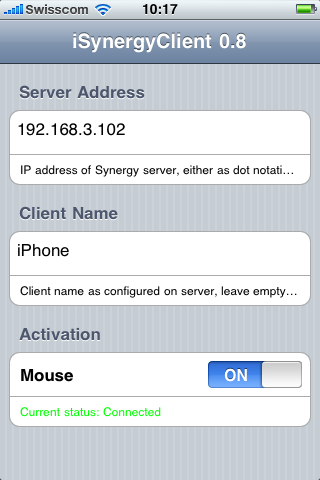 iSynergyClient provides an independent client of the Synergy protocol for the iOS. In this implementation, middle and right mouse buttons can be assigned using Activator. * Install a Synergy server, e.g., QuickSynergy for Mac or Synergy+ for Windows. * Enter IP-Address of your Mac/PC in "Server Address"
* Enter "iPhone"(or the hostname) as "Client Name"
* Tap the ON switch and move mouse over from Mac/PC. * Done. Your mouse is on your device!